Sparkly shoes to greet the New Year! Happy New Year to all my Catholic peeps!! Today is the First Sunday in Advent and that means on the Church calendar it’s New Years Day. Today, I decided to embrace this new liturgical season and dress in the appropriate color of purple. The first Sunday of Advent symbolizes Hope with the “Prophet’s Candle” reminding us that Jesus is coming. The candle is purple and so are the linens that drape the church. It is the beginning of a “mini” lent as we wait and prepare for the child Jesus. I don’t have a lot of purple in my wardrobe but I do have a trumpet skirt which I pulled out and paired with a “splatter paint” shell. I topped it with a purple cardigan and drop earrings. 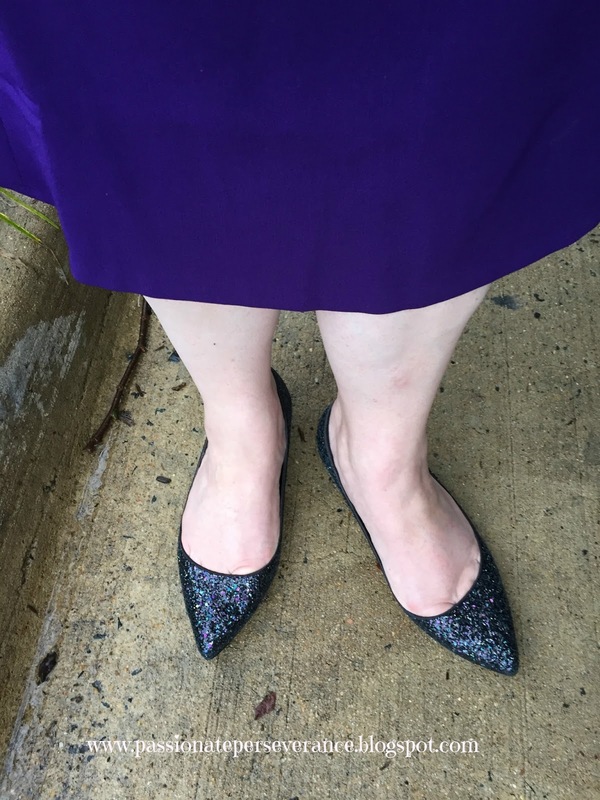 Target provided a fabulous pair of sparkly flats to bring it all together. Unfortunately I did not have time to put on make-up at 6 a.m. this morning and boy can you tell. I am. It’s a good tired though. Yesterday was a busy day setting up the church for the first week of Advent. So many things to accomplish in the next two weeks. My “to do” list is quite long but I am confident with the Good Lord’s help and my Courtney whispering encouragement in my ear, I will make it through. 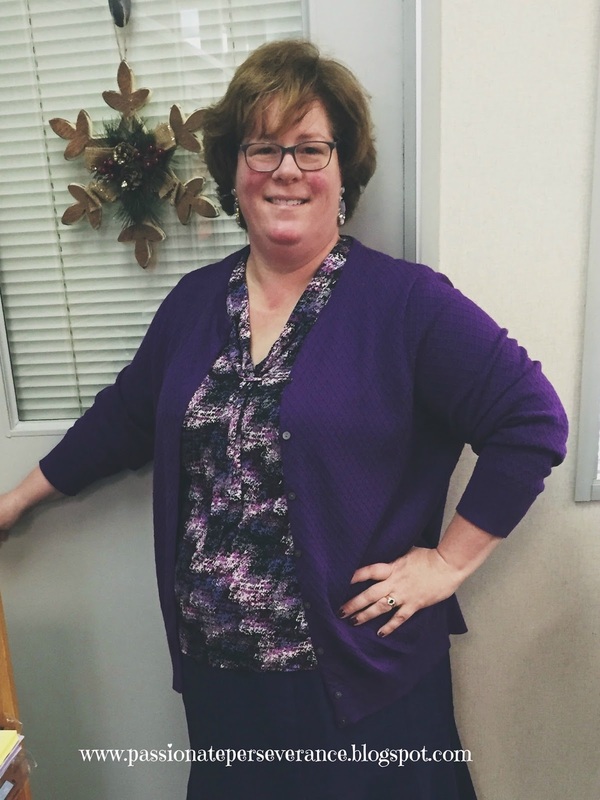 Next week’s “what i wore” will be another purple outfit. Not sure what it will be yet but my closet will reveal the secret in time. What are you wearing? Got any inspiration for me?? Love this! Apparently I thought it was Gaudete Sunday because I was more pink than purple. I will be purple next week. I have been a follower for quite a while, but I think this is my first post. I love that you are embracing JOY, when some days a warm blanket and staying in bed would be much easier. Thank you for your witness! I'm more of an indigo person for Advent. Wonderful title for a blog. Sending small donation…pray for Sarah if you would.